I was recently fortunate enough to be a part of a "Women Travel Writers Weekend". The trip was hosted by the New Orleans Hotel Collection in cooperation with Travel Girl Magazine. I was especially excited about the trip because 4 of my NJDigitalMom friends were also attending the girls weekend getaway. Visiting NOLA with friends? Awesome! I had never been to New Orleans before, and I had this idea in my head of what NOLA would be like. I envisioned Mardi Gras-like parties morning, noon, and night. Drinking, eating, dancing. (I will admit I was nervous about the condition I would be in at the end of the weekend! haha) While you CAN get your fill of partying until the sun comes up... I also found that NOLA really offers something for absolutely everyone. Music, history, art, sport, food, drink, culture, sight-seeing, celebrations... NOLA has it all. It offers up the perfect trip for anything from the girls weekend, to a family vacation, to a romantic getaway for two. 1. Walk. Either take a walking tour or simply step outside and wander. We were treated to a Gray Line walking tour. Our guide, Etienne Skrabo was amazing and gave us so many insights into the history and architecture of New Orleans. He also made sure we were able to test out a couple of drinks that New Orleans is known for (we sipped on Sazerac and Absinthe). One walk is never going to be enough to see the French Quarter. My friends and I found ourselves wandering the beautiful streets of NOLA on multiple occassions. 2. Eat. The food. Oh. My. Goodness. The food! Every single thing I ate all weekend was amazing. We were treated to some of the most delicious foods at both historic and trendy new restaurants. My favorite spots that I would absolutely revisit and highly recommend? Tableau, Kingfish, Antoine's, Cafe Du Monde... I could go on and on, and I was only there for a few days. I don't think it's possible to get served bad food in NOLA. 3. Talk. When you visit the restaurants and shops, talk to the locals. We were introduced to some amazing people. One of my favorite experiences ended up being a spontaneous tour of Antoine's Restaurant. We had eaten a late lunch. When we finished up we asked the waiter about the restaurant. The next thing we knew he was walking us around the entire establishment (which is HUGE and has various large/small/private/party dining rooms). Having been opened since 1840, the history contained within those walls in immense. We had planned a little shopping after lunch... but what we experienced was so much more valuable. If you are ever in NOLA, talk to the people (especially if you have the chance to get into Antoine's off peak hours). The pride they have in their history and roots is audible. Oh... and if you're brave... ask anyone for their favorite ghost story. NOLA seems to have haunts lurking in every corner! 4. Listen. New Orleans is full of music. There is just music in the air. Whether you pick a scheduled concert, a Jazz Brunch at the Court of Two Sisters, or just wander the streets in the evening... you can't help to find music that fills your heart. While we were enjoying Dirty Linen Night I found these 2 musicians who were immediately my favorite. 5. Participate. There is always something going on in New Orleans. ALWAYS! Music festivals, art festivals, parades, food and wine events, marathons and runs... the list goes on and on. The events calendar is PACKED. I think you would be hard pressed to find yourself in New Orleans when there wasn't some kind of event to participate in. 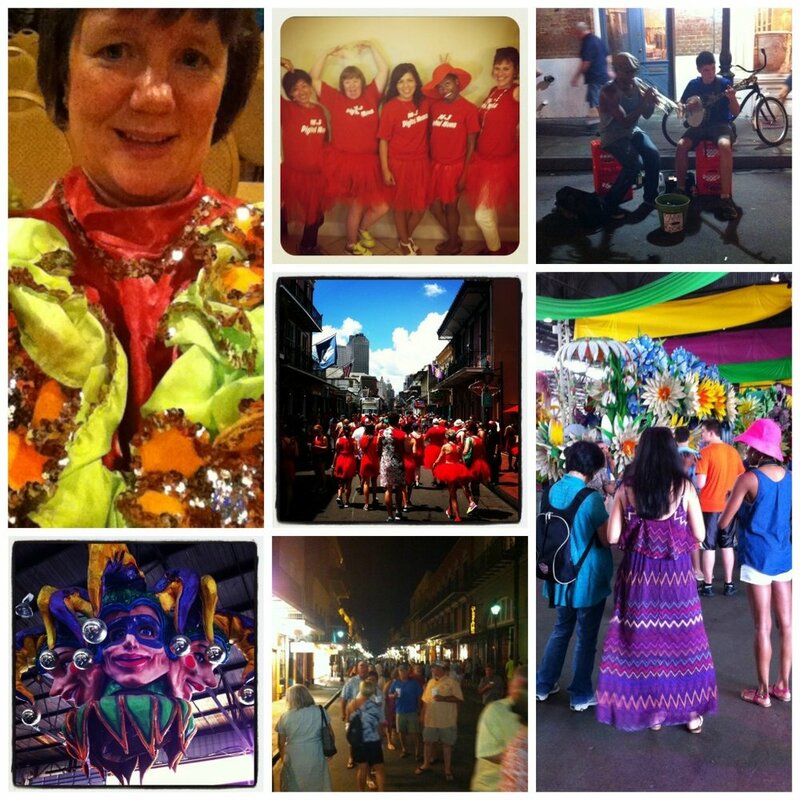 We found ourselves in NOLA during the Red Dress Run and Dirty Linen Night. While we missed out on Mardi Gras, we were able to enjoy Mardi Gras World. There is just so much fun to be had in NOLA. 6. Relax. If you successfully accomplish steps 1-5 you are going to NEED number 6. NOLA can be non-stop action. You need a place to decompress. I can tell you, after seeing a number of their properties, the New Orleans Hotel Collection has a relaxing spot for everyone. If you're looking for a quaint, quiet getaway hidden away in the middle of the French Quarter you can't beat the Audubon Cottages. Some of my friends stayed there and it was amazing how it seemed like a far away retreat. If you're looking for modern and trendy I don't think you can beat the feel of the Hotel Le Marais. If you're looking for historic "serenity in the heart of the French Quarter" try the Dauphine Orleans. And... if you're looking to stay in the "most haunted hotel in New Orleans" make sure to book your room at the Bourbon Orleans... which is where I stayed. It is a beautiful historic hotel situated right between Bourbon and Royal. Rooms have been fully renovated... but that doesn't seem to deter the ghosts. While the soldier, children, nuns, and dancer all left me alone... my friend Amiyrah did have a little blond visitor (I think she was trying to tell Amiyrah she wanted a beignet.) Honestly... any hotel you choose from the NOLA Collection is a guaranteed win. My girls weekend getaway was a huge success. Months later I'm still madly in love with New Orleans. I hoping my next trip will be a family getaway (with visits to Mardi Gras World, the Zoo and the Aquarium)... or maybe I'll have to schedule that romantic getaway at the Audubon Cottages. So... ask me to list my favorite vacation spots? NOLA is going to be there.